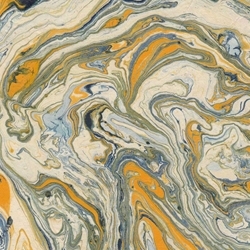 Inspired from the grain of texture in granite and stone, this Marbled Lokta Paper features veins of bright yellow and navy flowing against the handmade natural Lokta paper. Both the paper and the marbling are crafted by hand in Nepal. Inspired from the veins of texture in granite and stone, this Marbled Lokta Paper takes earthy color to a whole new level. Intricate marbled patterns in bright yellow and dark blue flow across each cream-colored sheet creating a one-of-a-kind design on each and every sheet. Lokta Paper is a strong, durable and eco-friendly paper handmade from the fiber of the "Nepal Paper Plant," also called the Daphne Shrub or Lokta Bush. This paper features subtle fiber inclusions, adding handmade beauty to whatever you create with it. The Marbled Lokta Paper then takes vibrant colors and marbles them over the entire sheet. Use this paper as a wonderful “blank canvas” for art applications, paper crafts and is ink jet and laser printer compatible. The fibers are long and flexible providing exceptional strength. Lokta Papers are acid-free and weigh approximately 45 to 60 gsm for a moderate weight, handmade paper lending itself to a multitude of art, craft and home décor uses as well as an excellent gift wrap.